Google CEO resigns from Apple Board of Directors | Android Blast! 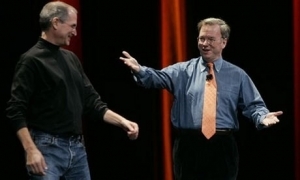 Google CEO Eric Schmidt is stepping down from Apple's board. As Google moves into business areas that overlap with Apple's, the potential for conflict of interest is increasing. It looks like both Schmidt and Apple realized the conflict and decided to part ways. "Eric has been an excellent Board member for Apple, investing his valuable time, talent, passion and wisdom to help make Apple successful. Unfortunately, as Google enters more of Apple�s core businesses, with Android and now Chrome OS, Eric�s effectiveness as an Apple Board member will be significantly diminished, since he will have to recuse himself from even larger portions of our meetings due to potential conflicts of interest. Therefore, we have mutually decided that now is the right time for Eric to resign his position on Apple�s Board."